a) .......... is not the mode of reservation. b) The perfect hotel traffic includes. c) Which of the following is not needed to clean glass? e) Which of the following is a light breakfast? 4. How do you deal with the suspicious people in a hotel? Explain. 5. What is the purpose of preparing VTL? 6. List down the need and importance of cleaning. 7. Mention cleaning equipments and materials required for hard floor. 8. Write notes on mise-en-scene. 9. What are the points to consider during service of cigar? 10. Define salad. Explain the parts of salad. 11. Write down the importance of accompaniment? 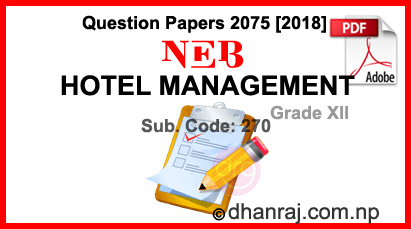 0 Response to "Hotel Management | Code-270 | Class 12 | Exam Paper 2075  | National Examinations Board"